Dartmouth, MA – Lloyd Center for the Environment Board Chair Robert “Brodie” MacGregor has announced that Rachel Stronach will be the new Executive Director of the Lloyd Center. Stronach, the Director of Education at the Center, succeeds D’Arcy G. MacMahon, who last summer announced his intention to retire from the post early in 2013. “I commend the Search Committee for having generated such a strong pool of candidates”, MacMahon said, after learning of the appointment, “and for having selected Rachel Stronach as the candidate best qualified to meet the leadership needs of the Center, going forward. With demand for the Center’s program services at an all-time high, a new strategic plan in place, significant facility upgrades undergoing review, and the recently acquired Lloyd Woods property at last permanently protected, this is an opportune time, in the Lloyd Center’s history, for Rachel to be taking on this new responsibility”. Ms. Stronach received a Master’s Degree in Marine Biology from Nova Southeastern University in Fort Lauderdale and a Bachelor of Science Degree in Fisheries Conservation and Management from the University of Massachusetts Amherst. No stranger to the South Coast environmental scene, she interned at the Lloyd Center in the summers of 1997, 1998 and 1999, where she conducted environmentally-themed classes, programs and workshops for school children and was an assistant teacher for summer science programs, focusing on the ecology of the southeastern Massachusetts coastline. 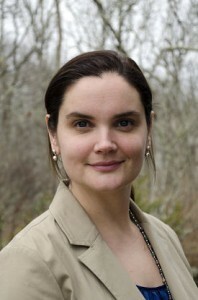 In 2000, she served as a research intern at the New England Aquarium in Boston, where she was a lab/field assistant for the Massachusetts Freshwater Aquatic Biodiversity Program, collecting, sampling and classifying freshwater invertebrates and overseeing the testing of water quality at various field sites. The following year, she served as an education intern at the Nature Conservancy at Nags Head Woods in Kill Devil Hills, North Carolina, where she developed and implemented environmental programs for school-age children, lead ecologically-themed hikes and kayaking trips for the general public, and developed trail guides for visitors based on natural history and the flora and fauna of Nags Head Woods. In September 2001, Ms. Stronach joined the Center’s highly regarded teaching staff, where she worked for four years as an Educator/Naturalist, before departing in 2005 to pursue her Master’s Degree. While on the staff, she taught in every one of the Center’s educational programs, both in schools and at field sites, and was responsible for the development and implementation of summer courses in coastal ecology and marine biology for students entering grades five through eight. In November 2007, Ms. Stronach presented at the 17th Biennial conference on the Biology of Marine Mammals, Cape Town, South Africa and, in April 2009, presented at the Southeast and Mid-Atlantic Marine Mammal Symposium, University of North Carolina, Wilmington. Ms. Stronach has been a member of the Society for Marine Mammalogy (SMM) and the Marine Technology Society (MTS), and is a National Association of Underwater Instructors (NAUI) Certified SCUBA Diver. From January 2008 through June 2009, Ms. Stronach worked as a 7th and 8th Grade Mathematics & Science Teacher/Teacher Intern at New Bedford’s Global Learning Charter School, where she was responsible for the implementation of mathematics and science curriculum in line with the Massachusetts Curriculum Frameworks. She has played a major role in the success of the Lloyd Center’s Climate Science Learning Project (CSLP), a unique undertaking that teaches science and mathematics by incorporating these fields into a hands-on outdoor environmental education program. Under her command as Director of Education, the Lloyd Center was chosen as the lead educator for the Museum Institute for Teaching Science (MITS) Southeast Region 2013 Summer Institute. She has been an active member of the Board of Directors of the Southeastern Environmental Education Alliance (SEEAL) since 2009 and now serves as its Vice-Chair.